This one is for ginger lovers. I finally got a copy of Plenty—having always remembered the great food I ate at Ottolenghi when I was in London a few years ago—and came across the recipe for Cucumber Salad with Smashed Garlic and Ginger. A cucumber salad will always make me perk up, but what seemed fun about this recipe was the method, in which ginger and garlic are pounded into a ragged little slurry. I’ve grated ginger, I’ve sliced it. I’ve minced it, I’ve julienned it, I’ve cut it into rounds on the bias. But for whatever reason I’ve never considered pounding it this way. It sounded fun and easy! And it is. The ginger turns pulpy and juicy, and you’re reminded how much heat it packs. 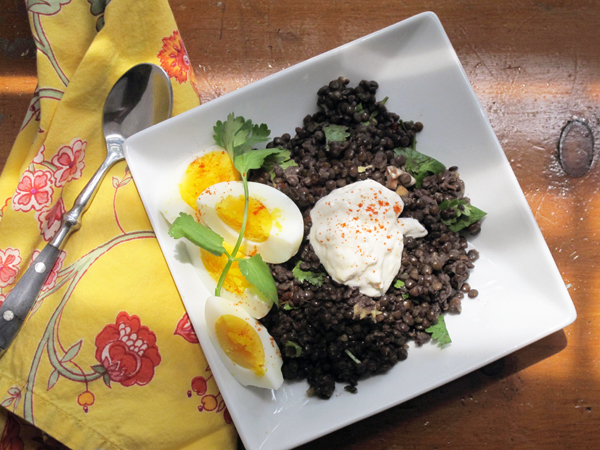 I applied the treatment to lentils for a super easy, fortifying dish that wouldn’t require much time over the stove. (Right now, in my un-air-conditioned apartment, any cooking requiring heat is done at the crack of dawn.) If you don’t have a mortar and pestle—and who hasn’t fantasized about owning a really huge mortar and pestle after that scene in My Life in France (and Julie & Julia) where Paul Child comes home with one hitched over his shoulder?—your best bet will probably be to slice the ginger thinly, sprinkle it with the kosher salt, then mash with the blunt side of the a sturdy knife until it gets pulpy. Firm, nutty lentils that hold their shape after being cooked work better here than brown or red ones (red ones would be much too mushy). I recommend using French green ones or black Beluga lentils. And you can take this in a million different directions: over fresh or cooked greens; with a medley of roasted or fresh, crunchy vegetables; spooned over toast with a smear of mild cheese. I didn’t do too much to complicate things here. A spoonful of yogurt offers some chill and tang and helps to control the heat in the ginger. I also added a hard-boiled egg so as to round it off as an entrée, but you might find that part optional. And a sprinkling of paprika is mostly cosmetic, but I couldn’t resist. 1. Combine the lentils and water in a small saucepan. Bring to a boil, then add 1/4 teaspoon Kosher salt and a splash of olive oil. Cover, turn down the heat to low, and simmer for 20 to 25 minutes, until the lentils are tender. Drain off any excess water if necessary, then transfer to a mixing bowl. 2. 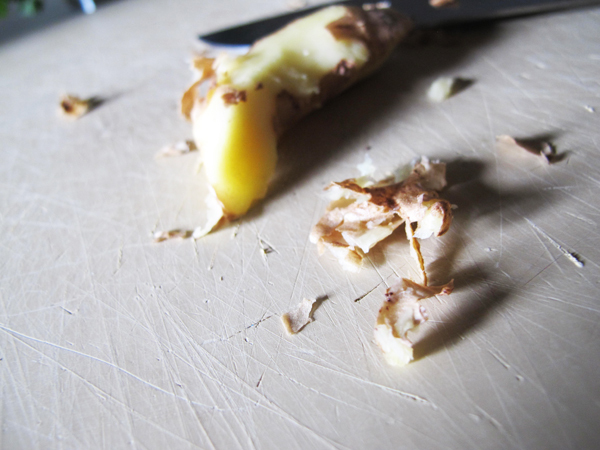 Peel the ginger (I like to use the back of a knife, but do whatever works best for you as long as you don’t dig too deeply into the flesh) then slice into thin-ish rounds. Place in a mortar along with remaining 1/2 teaspoon Kosher salt and pound with the pestle until the ginger is juicy and somewhat pulverized. Add the garlic and continue pounding until it’s broken down. 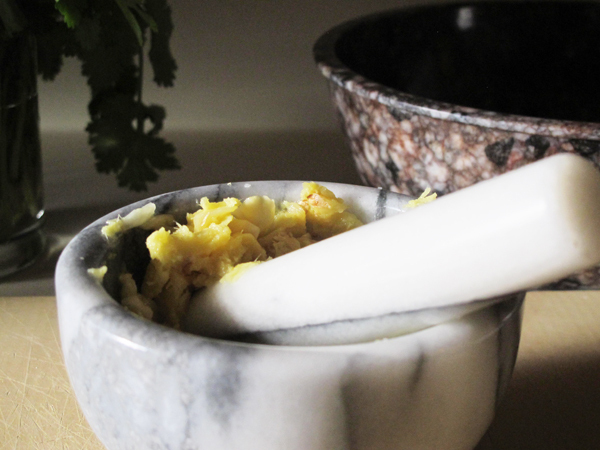 The mixture shouldn’t become a paste—some ragged pieces of ginger and garlic are nice. Using a spatula, scrape the entire contents of the mortar into the bowl with the lentils. Add the parsley or cilantro, a tablespoon or so of olive oil, several grinds of black pepper, lemon juice to taste, and toss to combine. Adjust seasonings. 3. Divide among plates and top with a tablespoon of yogurt and a hard-boiled egg each. If desired, garnish with a slight dusting of paprika. The lentils can be served cold, room temperature, or warm.